Jim Briggs sends his croquet ball towards a wicket. ( MICHAEL S. WIRTZ / STAFF PHOTOGRAPHER ). One summer in the mid-1960s, my blue-collar neighborhood went crazy for croquet. Suddenly everyone had a brightly colored ball-and-mallet set from Montgomery Ward. The kids would arrange the wickets and then play for hours as our transistor radios blared. If we forgot a rule, we made one up. 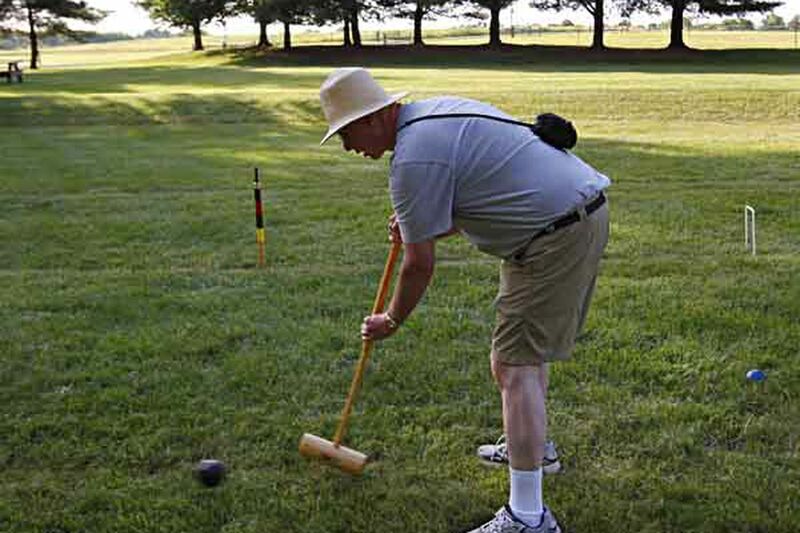 These days, regulation play is the rule, but croquet fun is plentiful at Smithville Park, where Eleanor Dunker and her pals gather for six-wicket competitions on Wednesday evenings. Says Dunker, a retired kindergarten teacher from Springfield Township: "This is not the backyard game you remember as a child." The grass is verdant, the breeze delicious as the gang unpacks gear and quaffs iced tea at the Burlington County park in Eastampton. There will be eight of us on the court, all accomplished players, except for a visitor. "It really is a mental game," Dunker says. "Bruce taught me not to just think about the shot you're making, but to think two and three and five shots ahead." Bruce is Bruce Shaw, of Moorestown, who along with his wife, Judy, plays regularly, and with considerable skill. The Shaws have been playing for nine years, and they love the game, as do Jim and Connie Briggs, from Mount Laurel, and friends Joan Fry, of Pemberton Borough, and Wendy Dobovich, of Pemberton Township. "On a long-grass court, you've got to hit harder," advises Bruce, who enjoys playing with "the heavier rosewoods." He hands me one of his mallets. It feels like a precision instrument; I must arrange my hands properly to wield it in a worthy manner. "Swing through," suggests Jim, a retired engineer. I lean forward, attempting to transform my arms into a pendulum that ticktocks inexorably toward the fist-sized red ball in the grass. "Often this game is compared to golf, and also to chess," Bruce observes, patiently. "You're always playing defense and offense." At its simplest, croquet is a contest in which a player uses a mallet to propel a ball through a series of wickets more expeditiously than one's opponents. A knowledge of geometry is not required, but helpful, as is a certain . . . ruthlessness. Croquet was developed, most likely in Ireland, in the mid-1800s, but the British really took to it, standardizing rules and equipment. The game evolved into a genteel pastime for Victorian couples, but don't be fooled by images of long-skirted ladies and jacketed gentlemen. Its Byzantine rules and cute lingo allow for, enable, and even encourage nefariousness. For example, under some circumstances it is perfectly legal to strike one's ball into a rival's, sending it away from the wicket and into Siberia. This can be done more than once. "You can not only destroy the opponent, but you have time to trash-talk," says Bob Alman, editor of the online magazine croquetworld.com. "There's true viciousness in the sport, along with the joy of winning and the tragedy of losing," he adds, speaking to me wryly from West Palm Beach, Fla., where the United States Croquet Association has its headquarters. The association sponsors 300 clubs with a total membership of 3,000 and estimates that 10,000 people play croquet in America. It hopes faster, more videogenic "golf croquet" - a variation on the rules but not the equipment - will attract new interest. Meanwhile, my Smithville comeback fizzles. My swing is wild, yet weak. "But we're never mean to each other," adds Dobovich. They're right; the whole evening is eminently civilized. And when it's over, Jim gallantly calls me aside. "Connie and I were winning, but 20 minutes later, we lost to Eleanor," he says. That would be Eleanor, my partner, whom I, alas, abandoned. But all is forgiven. "Your red ball," Jim says, "was the winner."